The S&P was up 3.2% for the month of July with our Stock Picks up 3.4% during the month. Strong results from the likes of Honeywell, Bank of America, and The Walt Disney Company. Facebook was the big laggard of the month. Geopolitical concerns still loom, but we are confident in our portfolio to close out the remainder of the year. In early January, I published my top picks for 2018, see article here. As a reminder for readers not familiar with my strategy, I am a dividend growth investor in my mid-30s with a long-term horizon (hopefully), and my plan is to invest in well-rounded companies with a quality track record, superb management team, and strong dividend growth potential. 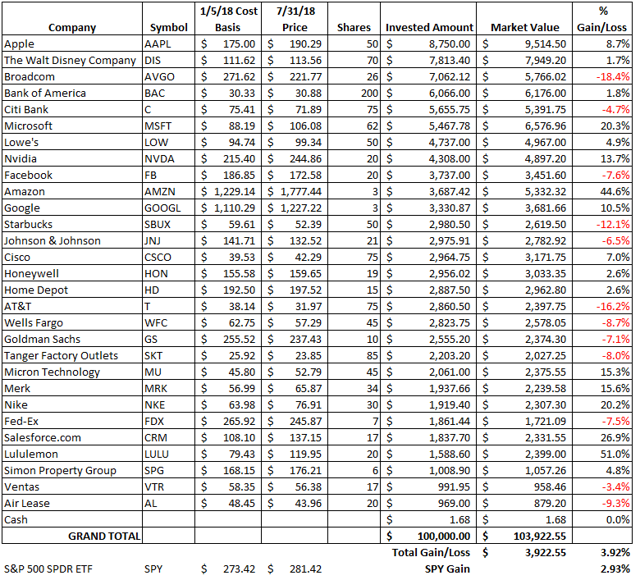 Towards the end of last year, numerous followers asked that I put out a list of stock picks for the year. As such, I constructed the list below with the goal to beat the performance of the SPY. The portfolio started with investable funds of $100,000 that were allocated amongst the stocks listed below. This portfolio will not be actively managed; however, I will provide commentary around any ideas or changes I would consider making. This piece will focus on our progress through the month of July, which saw a return of the bull market, after a rough start to the year. The portfolio got off to a rough first quarter, which contained the single largest point drop in the market ever. However, after a strong month of May and now July, we are back outpacing the SPY year to date. We are now into the second half of the year with our portfolio outgaining the S&P 500 by 99 basis points. We have seen great results from a lot of our picks, but unfortunately, a couple outliers so far have really hurt the overall results. Two of the aforementioned “FANG” stocks, Netflix (NFLX) and Facebook (FB), took it on the chin in July with disappointing earnings results. Unfortunately for our sake, we had FB in our portfolio. Technology has been under some pressure closing out the month, but outliers Alphabet (NASDAQ:GOOG) (GOOG) and now Apple (AAPL) have guided the sector back on track. Apple released positive earnings yesterday, so the appreciation today will not be in the results below. Since we began tracking our trades at the beginning of the year, the S&P 500 has increased 2.9% during that span, of which, it was up 3.2% during the month of July. Geopolitical concerns still hover over investors with possibilities of a full-blown trade war not only with China but with many other countries as well now. We did see some positive news come out of this as the EU came to an agreement with the White House a couple weeks ago to ease some of the trade restrictions. Unrest in the Middle East and talks with North Korea de-nuclearizing itself are all still big topics watched closely by investors. In addition to those geopolitical concerns, the Fed is continuing its plan at raising rates at a rapid pace, with a potential for two more rate hikes likely coming in 2018. Based on the strength of the jobs market, which recently reported an unemployment rate of 4%, which is slightly above last month’s 18-year low, we believe it is a foregone conclusion that the Fed will not slow down this pace. The most recent hike came in June with the next hike expected at the September meeting, followed by one in December to close out the year. President Trump was vocal about his disagreement with the Fed regarding the pace at which they are raising rates, saying it is a threat to the growing economy. So, without further ado, here are the July results for the Big Ticket 2018 stock picks. Through the month of July, the portfolio outperformed the SPY by 99 basis points. 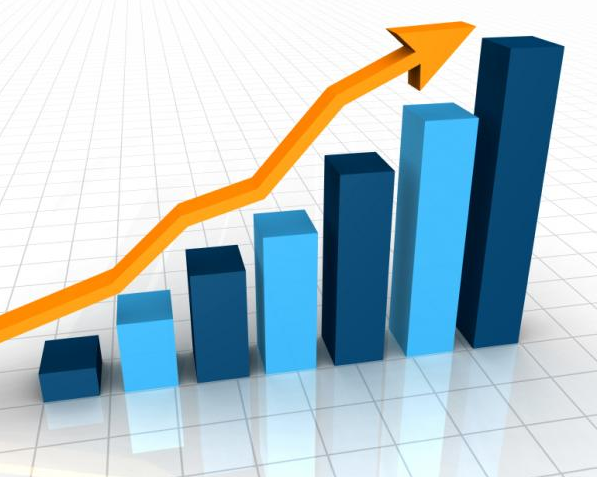 The portfolio has begun to hit its stride coming off strong months in May and now July. 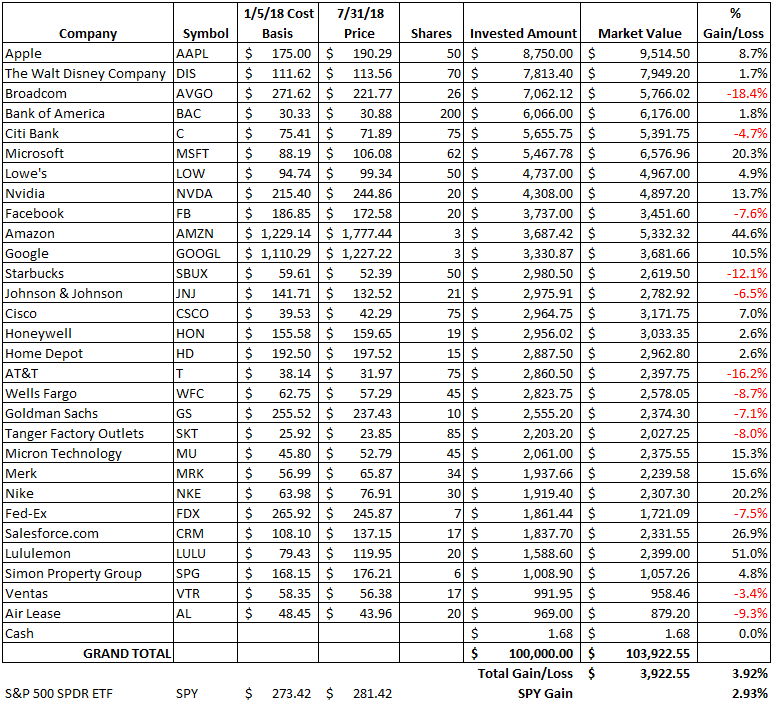 We only had six of the 29 stocks have negative results in July. Unfortunately, two of those were in our top 10. 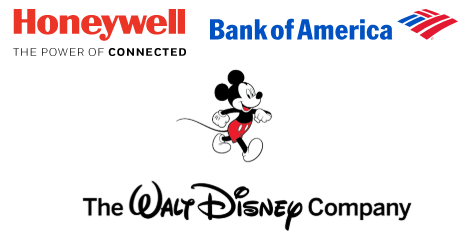 Our top three performers for the month were Honeywell (HON), Bank of America (BAC), and The Walt Disney Company (DIS). After this month’s strong run, all three of these stocks are now in the black for the portfolio. During the month, Honeywell released strong earnings and also raised guidance for the remainder of the year, which helped the company to increase 10.8% during the month. Honeywell is known for being ultra-conservative with their guidance, so to see guidance raised was a welcoming sight for investors. Aerospace has been the company’s leading segment of growth with the company’s 2018 guidance starting the year at 2% to now over 7% growth on the year. That is a staggering uptick in guidance over two quarters. The banking industry reported lackluster earnings results during the month, but Bank of America was among the better of the bunch. The bank beat estimates on top and bottom lines and is expected to grow earnings 36% by the end of the year followed by another 17% in 2019. Banks have been struggling with a flattening yield curve over the course of 2018, but BAC seems to be making the best of it. Trading at just 14x prior earnings seems like a value play for long-term holders. The Walt Disney Company reported strong earnings during the month that saw strong growth in media and entertainment as well as parks and resorts. The studio segment of the company continues to release hit after hit, with the studio owning nine of the top 10 largest box office openings of all time. Avengers: Infinity War crossed $1 billion at the box office faster than any film ever released, with worldwide box office of $2 billion to-date. Parks and resorts continue to perform at an extremely high level, with 13.2% growth in revenues for the Q1 ’18 and 13.5% growth in Q2 ’18. This group is on pace to achieve its highest growth since 2013. We rate this stock a BUY. The main laggard for the month of July was Facebook. Facebook was down 11.2% during the month, but most of the damage was done after the company released their disappointing quarterly earnings, sending the stock diving 20% in one day. The company lowered their guidance for the second half of the year as they boost security for their platform and other expenses. Lack of user growth during the quarter was another concern investors had after release of the report. The user growth story is a bit of a concern for us, but we also believe the company through the kitchen sink in with this quarterly report. Management wanted to get all the negative news in at once, thus, we believe this may provide a buying opportunity for those with the gut to take the volatility and a long-term horizon. Even though we do not make changes to the portfolio throughout the year, we do like to give insight as to what changes, if any, we would make during that given month. At the conclusion of July, we would still look for any opportunities on pullbacks to increase our exposure to Apple. We are big believers in the company and their future, particularly in their services segment. The company released solid quarterly earnings last night, so no pullback will be seen in the near term. Cisco (CSCO) has pulled back 1% during the month and is still a name we like in the space. They are at the tail end of the transition they set out to complete a few years ago, which has seen them focus more on service revenue, which has returned the company growth. Facebook is an option we think is worthy of an increased stake if it falls into the low $160s. The idea of the updates is to be completely transparent with my followers. Many contributors today will make stocks picks, but only follow up on those if they are positive, but I feel that readers respect you more when you are transparent regardless of the outcome. With that being said, here is to a solid August. Best of luck to all our followers! Now that you have had a chance to digest the portfolio results to date, I look forward to hearing your thoughts on the portfolio and hearing some of your ideas for any changes to be made. Good luck to everyone and happy investing! Note: I hope you all enjoyed the article and found it informative. If you do not currently follow us and would like to be notified of future articles, please hit the "Follow" button above. As always, I look forward to reading your comments below and feel free to leave any feedback. Happy Investing! Disclosure: I am/we are long AAPL, DIS, LOW, GOOGL, JNJ. I wrote this article myself, and it expresses my own opinions. I am not receiving compensation for it (other than from Seeking Alpha). I have no business relationship with any company whose stock is mentioned in this article.